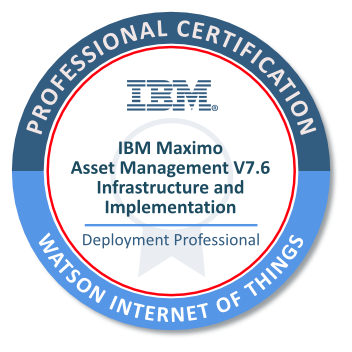 The badge earner is a technical professional responsible for the planning, installation, configuration, administration, tuning and problem determination of an IBM Maximo Asset Management V7.6 environment. This individual is able to perform these tasks with limited assistance from peers, product documentation, and support resources. Successful completion of the IBM Certified Test C2010-530 - IBM Maximo Asset Management V7.6 Infrastructure and Implementation.